I had a lovely time Friday evening at Smithtown seeing Tapestry, The Music of Carole King. The cast is wonderful and it's a very enjoyable show. A large percentage of the audience were there to join Kelly for her birthday celebration. When she made an announcement at the beginning of the show, Kristen had everyone sing happy birthday. Then, during the show, Chris sang "Go Away, Little Girl" to Kelly. Picture this: "Go away, little girl, go away, little girl. I'm not supposed to be in love with YOU" as he points directly at her and the tech crew shines a spotlight on her. Unsuspecting patrons at intermission: "Do they do that every show?" After the show, about 25 of us gathered at Applebee's and enjoyed ourselves immensely. On Thursday, Kelly and I traveled out to Sag Harbor for Once On This Island. It's such a beautiful production, I wouldn't rest until both Kim and Kelly had seen the show. I'm so happy we finally were able to see it. Other shows/plays I'd still like to see? Well, Roundabout will present Twelve Angry Men this coming season and that's a play I've always wanted to see so that makes me happy. I'm not enthusiastic about anything else upcoming at Roundabout but I'll be sure to see that one. I'd also love to see a production of A Few Good Men. I really like the movie and would love to see the play. I'm happy that in the last couple of years I was finally able to see The Crucible (which will also be at Smithtown this coming season) and The Elephant Man, two plays I really enjoyed. I had to talk Kelly into seeing The Elephant Man, something she's thankful for since she loved it. I'll be back at work the Wednesday after Labor Day, apparently. So, I still have this week off. I didn't have anything major planned in the way of chores this summer, which is a good thing since the month of July was entirely taken up by My Fair Lady. I have a little painting to do but I'm not sure I'll get myself moving to do it. I've been so lazy the last week or so since we've been back from vacation. I need to kickstart myself. Sigh. I did work on craft projects while away on vacation. I am almost finished with a crochet baby sweater, one of the test projects for the Knitware beta test. I ran out of yarn at the very end. In reading mailing list emails, I see that some people think it may be possible to design a poncho with the new program and I might try that. Now that ponchos are back in style, that might be fun to try on the knitting machine. This week would be the only time I can do that, I guess. After school starts, it would be a weekend thing. I also finished a book I was reading while on vacation, A Miracle for St. Cecelia's by Katherine Valentine. It's a sweet little book and I enjoyed it more than I thought I would. I've been too busy to just hang around and read like I did last summer. Now, I bought so many books on vacation that I'll have lots to read for awhile. In Gettysburg, all we bought were books (and the Gettysburg movie DVD). Oh! It seems there is now a movie version of the book Skipping Christmas, by John Grisham, that I read last fall. I LOVED this book and I'm so looking forward to this movie. It's such a funny story. That's it for today. Time's a-wasting and I have cleaning to do! We are currently presenting Tapestry: The Music of Carole King at the Smithtown Center For The Performing Arts, my fabulous workplace. It is a great show and we are having so much fun with it! This Friday, August 27 (which happens to be my birthday) we are offering specially priced tickets for the 8:30 PM performance. They are $10.50! I hope everyone comes out to help celebrate my birthday and to see my amazingly talented buddies sing their hearts out. For my city people, Smithtown is a stop on the Port Jefferson line of the LIRR and the station is only a few minutes walk from the theatre. You can either get tickets at the door or call the box office at 631-724-3700 and be sure to mention this email. (as in: "I want the Kelly's birthday $10.50 tickets, please!") Stick around for the after show festivities, which I'm sure involve me getting completely embarrassed by a cake somewhere. Feel free to pass this email along to anyone who might like to come! Let me know if you're coming, I will be so excited to see everyone. Hope you can make it! She has her own discount. I'm so proud! These are the pictures I took on Sunday. I had forgotten to change the batteries after vacation and they were weak so I didn't take any others. Diane Perri took a picture of the whole table and I hope she'll share with me! 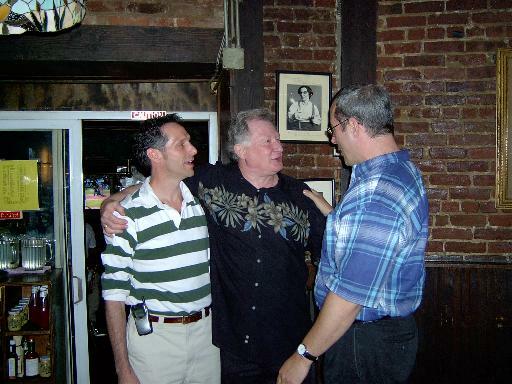 Oh, the memories we have of get-togethers at Barrymore's! Kelly has today and tomorrow off so we're going to see Once on this Island tonight. I'm very excited since I really wanted her to see it and this is probably the only time we can. So, we intend to visit the outlets in Riverhead and then see the show. Today is our wedding anniversary, 29 years. That means we've been married more than half our lives! What an eye-opener! Since we returned from vacation, I spent Friday cleaning, unpacking and doing laundry. Saturday, Kim, Bill and I drove out to Sag Harbor on the east end (ugh! more driving!) to see Once On This Island. The girls were in the show choir in high school and performed this show in competition and we've wanted to see it since. I was so excited to see it and it was well worth the trip. I absolutely loved it! It's a beautiful production. Coincidentally, it was directed and choreographed by Tony Dodge's wife, Marcia. Kelly wasn't able to come with us on Saturday but we hope to see it tomorrow evening since she has a couple of days off. Yesterday, I went into the city to see Marc Roselli. Marc is a friend from the Pimpernel days. He's a Jesuit priest and has been on assignment in Nigeria and had been visiting here briefly. 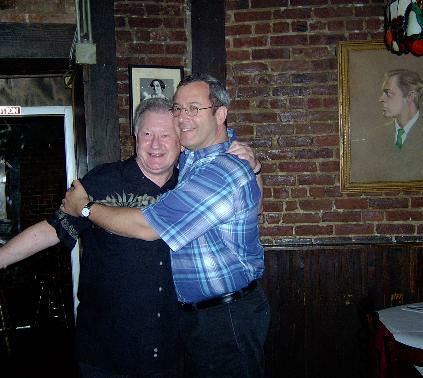 Some of us went to mass celebrated by Marc early in the day and we met with a group of friends at Barrymore's in the afternoon for lunch/dinner. Stephen Hope was there with us and Harvey Evans dropped by. It was such a treat to see everyone. Pictures will follow when I get them uploaded. I forgot before I started here. I updated the trip diary. All that's left is the trip home. Hi there, folks. Here I am in St. Augustine, Florida, having survived Hurricane Charley and still vacationing. For an account of our adventures up until now, check out Vacation 2004. I'll update as we continue at Disney World tomorrow. Greetings from Gettysburg, PA! We arrived yesterday afternoon and have been exploring the town. Every time we've been here, we've toured the battlefield but never really saw the town itself. We visited the Jennie Wade House museum, the Lincoln train museum and a museum of artifacts. I visited a shop called Abraham's Lady which sells period clothing, patterns and fabric. Last night, we ate at Dobbin House. It is the oldest house in town, built in 1776 by Rev. Dobbin. The food was amazing and the atmosphere very period and relaxing. This afternoon, we had lunch at Farnsworth House, another period house which is also a tavern. Very nice. ...starting the month of August here. Summer vacation has been busy. On Monday, I'll really be on vacation when Bill and I take a trip. We'll be making several stops and I'm looking forward to it. When we return, I'll have about a week and a half before school starts again. Hard to believe. The whole month of July flew by with the show monopolizing me and Kelly. It closes Sunday afternoon. Hopefully, the fall won't be as stressful as it was last year with the unusual schedule I had. I'm hoping the new schedule at Copiague will be easier to deal with and will make the teaching schedule at BOCES easier to deal with as well. 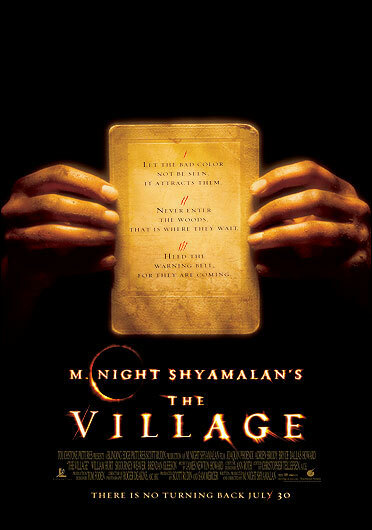 Kelly and I saw The Village a couple of nights ago. I do enjoy Mr. Shyamalan's scary movies! It's fun waiting for the twist at the end that I don't see coming. I still think Sixth Sense is his best movie but I enjoy the make-you-jump scariness of his movies. And Kelly and I did a lot of jumping! Fun.